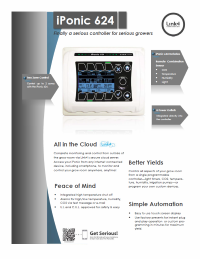 The iPonic 600 Series controller is a revolution in hydroponic grow room controllers. 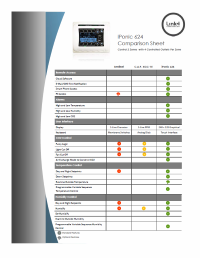 Developed for large scale commercial greenhouses, the iPonic 600 Series controls all grow room functions in a single intelligent controller. 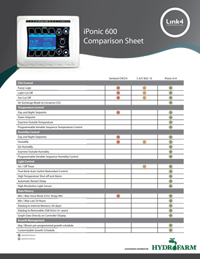 Instead of controlling only a few limited functions like most controllers on the market, the iPonic 600 Series can control them all. Functions can also be easily changed to match the configuration of any grow room. 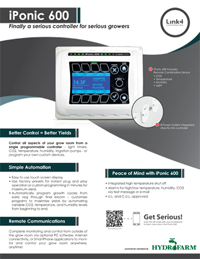 Control all aspects of your grow room from a single programmable controller - light timers, CO2, temperature, humidity, irrigation pumps - or program your own custom devices. Complete monitoring and control from outside of the grow room via optional PC software, internet connectivity, or SmartPhone applications to monitor and control your grow room anywhere, anytime!